CintaNotes is an application that can prove to be useful if you are a person who usually likes to write and leave different notes or saves frequently different types of information into text format. The application allows the creation and export of notes content. To create new notes, you can manually introduce the text using the Clipboard as an intermediary or simply you can take directly the text from other windows using a combination of keys (for example Ctrl+F12). Like other programs of this type, you have the possibility to look for keywords into created notes. Cinta Notes does not have features of sticky notes, though. 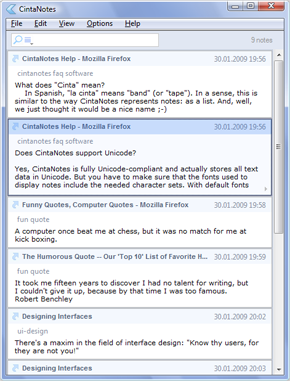 CintaNotes is pretty easy to use, and anyone can start using it immediately. If you want a more exhaustive option like a personal wiki software, try Linked Notes, or Zim. Because most of people usually try to close the applications instead of minimize them, be sure to check the option Close to System Tray which can be found under Options menu, by doing so you make sure that the application won’t close with your saved data, it will simply minimize into Tray will all your data still intact.